Plastics – Did You Know? For those of us dealing in mechanical and high-performance plastics, the advanced properties and abilities of these plastics to provide solutions in various applications can be a big surprise as we learn about them. After all, most people’s experience with plastics are in consumer items: electronic casings, packaging and disposable products. People come to believe that plastic is “cheap” and are therefore surprised when they learn about the properties of the more advanced plastics. It is a prejudice the industry is constantly fighting to overcome. -Did you know…PTFE is the third ‘slickest’ solid known? -Did you know…PTFE is also the only known substance a gecko can’t stick to? -Did you know…Fiberglass reinforced plastic (FRP) structural materials have 80% of the strength of steel, at 30% of the weight? -Did you know…Plastics outwear metal 2-20x in many applications? 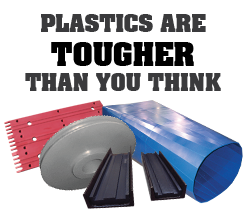 -Did you know…Versions of plastics such as HDPE and UHMW can provide medical radiation shielding? -Did you know…Plastic development helped fuel the post World War II economy? -Did you know…Elastomers such as polyurethane always return to their original size after any impact? -Did you know…Many plastics are recyclable? -Did you know…”Circuit board” laminates used in electronics are a type of plastic? -Did you know…Plastics such as Polyamide-Imide can continuously operate at 500 degrees Fahrenheit? -Did you know…UHMW-PE is unbreakable in ASTM notched Izod impact testing?